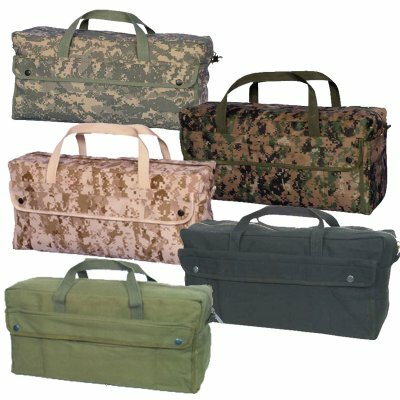 This large mechanic's bag is made of heavy weight cotton canvas for durability. It has a big, zippered main compartment and smaller side pockets secured with snaps. A fiber bottom keeps it from losing its shape, and there are dividers inside for small tool storage. Dimensions are approximately 19" x 9" x 6". Available in five colors: Black, Olive Drab, ACU, Desert Digital Camo, Woodland Digital Camo.